With the summer weather, pets are spending more time outside. Beware! Many residences are using rat poison. Even if you don't use rat poison, rats can transport it into your yard. Moreover, when bringing pets to friends homes, take a moment to ask or survey the yard. 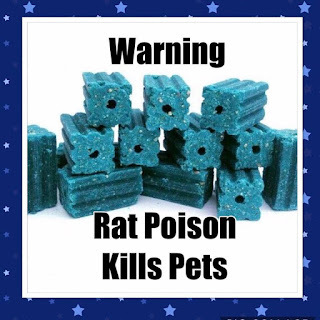 Ingesting rat poison can happen so quickly without you being aware especially when you are distracted. When Legend was a young pup, I brought him with me to visit my Mom. The residence had a huge yard and he loved to run around. For about two minutes, I spoke with my Mom's doctor and Legend was out of my view. As we were leaving I noticed he was chewing and I saw a tiny speck of bright blue on his tooth. They said they did not use rat poison and there was none in their yard (I later found out that their neighbor did and there was a hole in the fence.) I took him to the emergency as a precaution and sure enough he had ingested a lethal dose. If caught early, it's treatable and cureable. If you notice any signs of vomiting, lethargy, drooling or blood in vomit or stool, please don't wait to call the vet, go to an emergency clinic.